Chengdu Taste opened right before we got to Los Angeles last year and was immediately anointed the best Sichuan restaurant in the San Gabriel Valley (which is to say in the United States). We opted not to eat there last year on account of my general suspicion of hype. There were plenty of other places to eat excellent Sichuan at, we reasoned, and if it were still considered great a year later we’d eat there on our next trip. Well, the next trip is now and Chengdu Taste is still all the rage and so we decided to give it a go. As the lines are reportedly out of control for dinner every day and for lunch as well on the weekends we opted to go for weekday lunch. Well, we got there at 12.15 and only just beat standing in line. It’s not the largest space and at peak times (which seem to be all the time) you may have to share a table if you don’t want to wait. And so we did. The two of us were seated at a table for eight that already had two young Chinese women at it. I don’t know if they would have seated more groups with us normally, but since we covered the table with food it wasn’t really an option. Ten minutes after we got there there was a crowd outside, and when we left at about 1.30 it had only just begun to abate (the photograph above was taken as we were leaving with most of those waiting having made it to the inside). 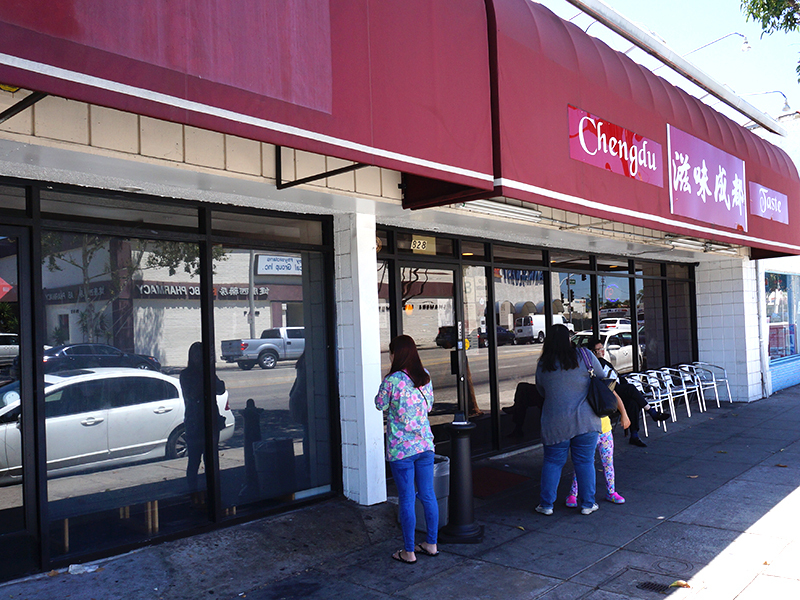 There is a second location opening soon in Rosemead—we were told either this week or early next—and that should go some way towards easing the crush (assuming the second location is larger than this one). Spring Onion Chicken in Pepper Sauce (Numb Taste). This was great stuff. The chicken, which appears to be poached, is in a slightly oily broth, jade green with finely minced green onions. It has a strong numbing aftertaste from the Sichuan peppercorns (which are not really visible at all in the dish). Toothpick Mutton. Mutton=lamb. Heavily redolent of cumin this could pass easily as a North Indian dish. The meat was tender yet crisp with just enough chilli bite to cut through the cumin and keep it from being cloying. This would be a great munching bar snack along with beer. Fish with Mom’s Preserved Chilli. Normally, I avoid anything in a restaurant that has the word “mom” associated with it but this was really very good: bright heat with a tangy twist from the pickled peppers and a smoky kick from the Sichuan peppercorns. And it was lethal. Tea helped (a little). Sauteed Arden Lettuce. I have no idea what Arden lettuce is but this simple saute with salt and garlic was just lovely and a nice relief from the fireworks of the fish. I have to start sauteeing lettuce. Flavored Pork Crura. This is one of two dishes that involve Pork crura. You may be wondering what crura is. We were too; this was one of the dishes pictured on the menu and it seemed like it involved pig skin and trotters and that was advertisement enough for us. What shows up is a shank, all the way from the knee to the trotter. Massive and massively good. Not anywhere as hot as the picture might suggest, this was perfectly cooked with the meat tender but the skin not falling apart. The sauce was mostly sweet–brown sugar, star anise (I think)–with the chillis there mostly for garnish and just a bit of heat.